Mick Travis sits alone in his study, his back against a wall plastered with war photos, shooting a dart gun at images hung up on the opposite wall: a womans naked body pasted atop a line of police in riot gear, a sleeping family, Big Ben, the queen in her carriage. Though he never says as much, these are all symbols of institutions that wield power over him. The upper-crust boarding school where Mick is a student is another; in the next scene, his younger classmates are whipped into a subtly terrifying frenzy over an athletic victory. Back in the study, Mick and his friends Johnny and Wallace drain a bottle of vodka and take a blood oath to each other, before Mick utters his famous line: One man can change the world with a bullet in the right place. a mistrust of institutions and an anarchistic belief in the importance of the individual to make his or her decisions about liferather than simply accept tradition and the institutional philosophy. Its a worldview Anderson developed most effectively in a trilogy of films starring Malcolm McDowell as the protean Mick Travisa character who changes so drastically and inexplicably from if.to O Lucky Man! (1973) to Britannia Hospital (1982), he might as well be a different person in each one. More than Micks personality, what connects these works is their evolving assessments of the state of Britain at three points on a 14-year timeline. Their pointed social commentary has earned the films (and their director) a reputation for being very British and exceedingly of their time, but thats a superficial judgment. In our current age of economic strife and malignant populism, Andersons satire feels far less dated than the idealism of his 60s contemporaries. Watching the trilogy now, in the US, it couldnt be clearer that in pointing out the absurdity of one place and period, they captured a brand of political absurdity that couldnt be more contemporary. Perhaps this is a strange thing to say about a movie that ends with a massacre, but if. is the most optimistic of the three films. Mick Travis, in his original incarnation, is the archetypal teenage rebel. In his first big-screen appearance, 24-year-old McDowell earned his Clockwork Orange role by tempering youthful anger with a magnetic grin and icy blue eyes so alert, they make everyone else in the frame look half-asleep. As the ringleader of a trio of outcast Crusaders, Mick is targeted by a band of older boys known as Whips who constitute the schools lowest but cruelest layer of authority. Though the Crusaders do break rules, from drinking to taking a joyride on a stolen motorcycle, its their iconoclastic attitude that poses the greatest threat to the school and ultimately leads the Whips to exact corporal punishment on them. 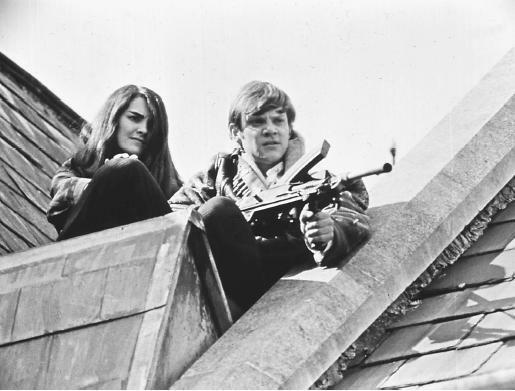 Its a humiliating enough experience that when they stumble upon some guns, Mick, Johnny (David Wood), Wallace (Richard Warwick), and Micks fiery love interest (Christine Noonan, playing a character known only as The Girl) decide to put his philosophy into action. if. culminates with a Founders Day fire that forces a parade of parents, administrators, clergy, and a visiting military official out of the school building and into the Crusaders crosshairs. Perched on the roof, these heavily armed individuals finally have an advantage over the sea of conformists on the ground.